ok, i just bought a 45 gal tote, 8' black air tubing and a long air stone. i have an old elite 800 air pump - but i think i will replace that once i am more organized with all the stuff i need. i need to cut the holes and get some net baskets and i guess some nutrient stuff.. oh, and i had some grommets around, but i dunno where they went for the air line tubing.. i'll have to look around for them. is there anything more i should be looking into cause i want to build this right as it is my first one.. so before i decide to start making holes and such i figured I'd come here for help. You are making a DWC by the sounds of the parts list? It sounds like you have it covered. Maybe 2 medium airstones instead of one long? That is not an issue though. Maybe some paint to insure it will block all light? Covers for the exposed grow media depending on the size of the baskets and how big the plants will be when potted? Pics of the finished build? but my tote is solid gray and is a 45 gal.. with a flat design unlike that designed cover..
where can i get the net pots cheap? and what size is recommended? Here is mine. 2 inch pots should work well. Google hydro dealers. They should be about 45 cents each. I posted the build, parts list, and methodology on my blog as well. DWC is by far the easiest in my opnion and the produce so far has been above expectations. what i did notice tho when i search for these, that mostly lettuce is being grown... can just about anything be grown? cause I'm more of a pepper, eggplant, etc... kinda guy - not too much a lettuce guy although i plan to have a couple of lettuce growing. gonna read yer blog now..
Congrats on getting your feet wet Ruffsta! Hydroponic gardening is a great hobby and your off to a good start with your parts list, more air the better when going DWC. Curious as to what type of light your planning on running? The limiting factor for indoor gardens is light. Light, or the lack there of, is the reason your seeing alot of lettuce and herbs grown hydroponicaly. You can grow anything you want including peppers and such if you put enough watts to it. Halfway has a great blog with lots of good information in it and his latest vid will give you some ideas about how to start your seeds. You need some type of medium, personally I'd recommend rockwool and hydroton but there's lots of options for you. picked up 9 5" net pots, some rockwool seed starters and some medium.. so I'm getting there slowly as for getting the parts i need. haven't decided on the type of lighting i need or want as of yet.. but yes i agree i seen some of his videos - very cool! 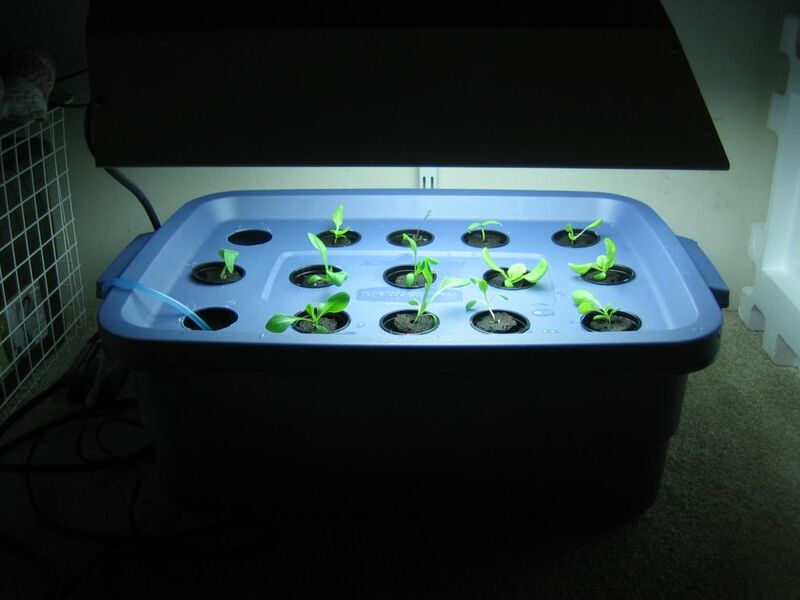 Based on what you want to grow and the system your putting together I would recommend either a 400watt HID or a T-5 fluorescent fixture that completely covers your growing area, 4' 8 bulb unit from the looks of the pictures provided. The plants you want to grow are both light loving plants and anything with less wattage than these 2 types of systems would be disappointing. There are LED systems out there but I have no personal experience in that area as of yet. k, at the moment i think all i am missing is the nutrients (which i have no idea about) and the lighting... and yeah i need some more medium.. do i put some medium under the rockwool as well? Dutch Master Liquid Light and Dutch Master Saturator... you guys have any views on these? What the salesman gave you is a foliar spray used much later in the crop. Foliar feeding is a great method for some plants but it is not the primary source for nutrients. The guys at DM do produce some decent products but their claims are a bit over rated if you ask me. Personally I use the Technaflora BC series of nutrients, and only the Boost and Grow at the moment. I do have some Bloom on hand and have used several of their other products in this line over the years. Anybody have any experience starting seeds in Oasis cubes?